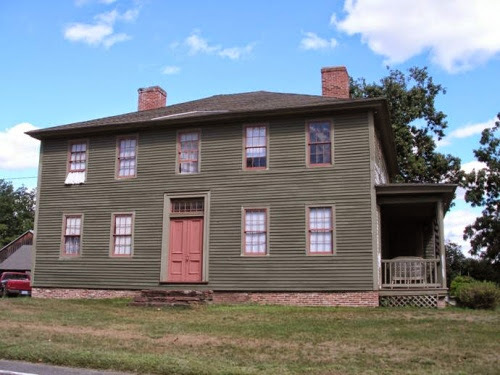 The 1796 Bissell Tavern, also known as Bissell’s Stage House or the Ebeneezer Fitch Bissell House, is located on Palisado Avenue in Windsor. The Bissell family also ran the ferry nearby across the Connecticut River to East Windsor Hill. The Bissell Tavern Sign is owned by the Windsor Historical Society. Swung for nearly a century by the roadside before a house called Bissell’s Tavern, at Bissell’s Ferry, East Windsor, Connecticut. Originally it bore an elaborate design of thirteen interlacing rings, each having in its centre the representation of some tree or plant peculiar to the state it designated. These interlacing links surrounded the profile portrait of George Washington. Above this was the legend, “The 13 United States.” Beneath this, “Entertainment by David Bissell, A.D. 1777.” Ten years later the words David Bissell were painted out and E. Wolcott substituted. The date 1787 was also placed in both upper corners of the board. 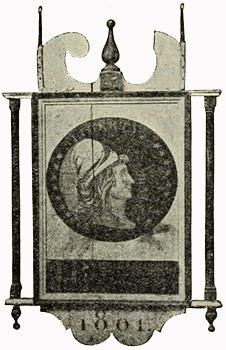 In 1801 the sign and house came to Joseph Phelps. 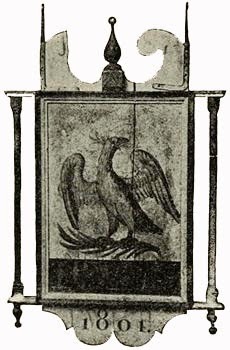 A new design was given: a copy of the first gold eagle of 1795, and on the other the reverse side of same coin and the name J. Phelps. In 1816 J. Pelton bought the Ferry Tavern, and he painted out all of J. Phelps’s name save the initials, which were his own. He hung the sign on the limb of a big elm tree over the Ferry road.